As a gardener, one needs to be on the look out for pests and disease. 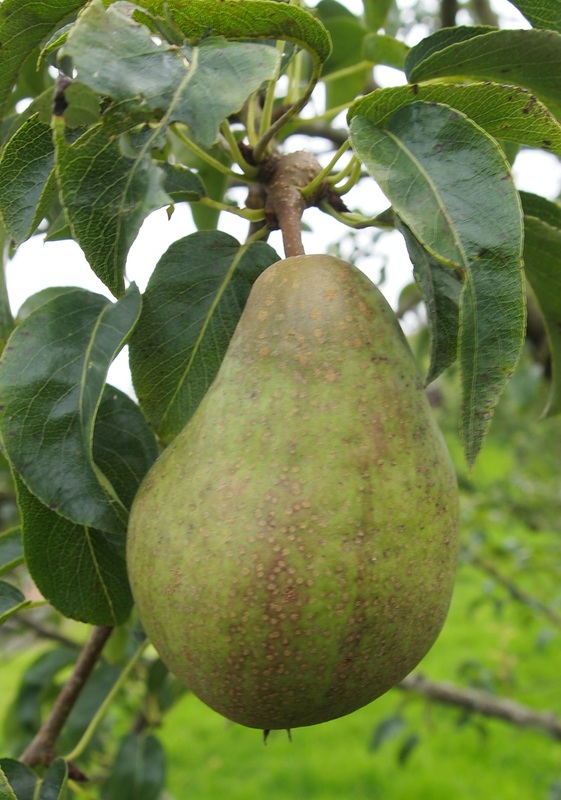 The photo below shows the result of some grey crows attacking our pears. 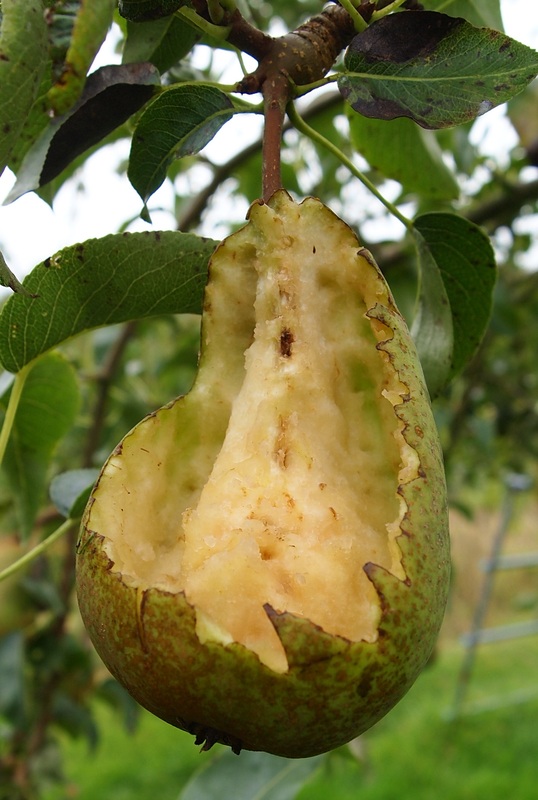 About ten pears were damaged, some like this, others with just a peck taken out of them. It’s meant we have had to harvest and store the fruit rather than risk losing more of the crop. They are pretty delicious so I can’t actual blame the crows for wanting to try them. Last year, when we had a a very small crop of plums (about 6), the magpies stole them before they were even ripe. Someone (I can’t remember who but they were a wise person) once said to me, you should always grow twice what you need, one half for yourself and the other half for all the little creatures that may wish to share your bounty, be they slugs, snails, rabbits, caterpillars or birds. This entry was posted in Fruit, Garden and tagged birds, fruit, fruit trees, garden, pears on September 26, 2014 by Murtagh's Meadow. Even though we are officially in autumn and sadly on the wrong (in my opinion) side of the equinox, a walk around the garden today with my camera reminded me there is still lots of wonderful things out there to admire. It’s just wonderful how many different ways plants package seeds for the coming of spring. 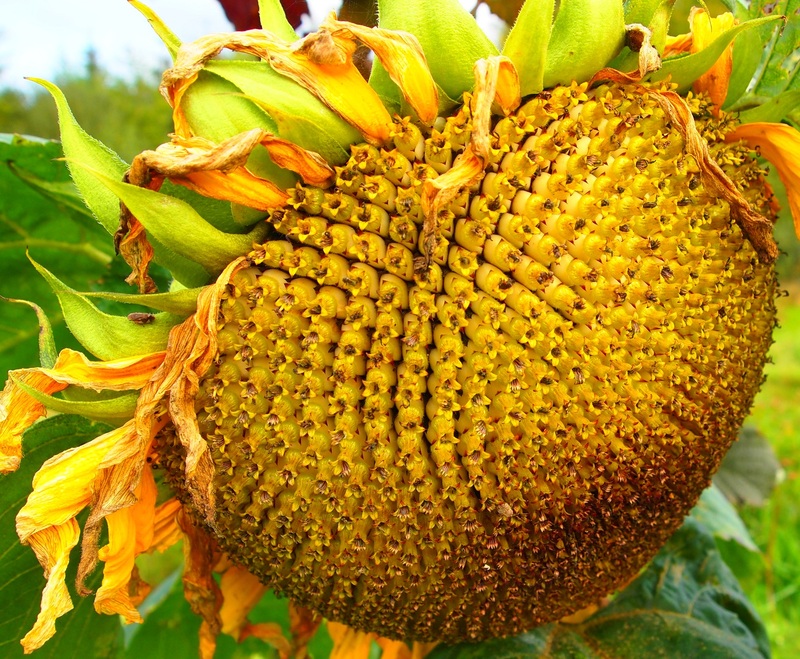 The yellow petals of the sunflower may be gone but who is to say those seeds don’t look just as interesting as the flower and I know they will certainly be attracting some birds in the near future. It also acts as a reminder to us gardeners that it is a good time to save some seed for next year. This week I have been drying some of those miniature pepper seeds and some courgette seeds (okay this was a well overgrown courgette / marrow). It’s a simple process. 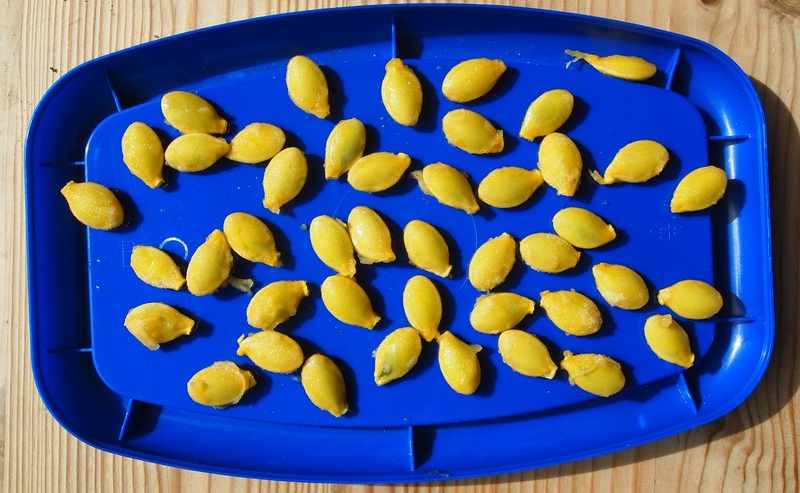 Just scoop out the seeds, removing any of the vegetable flesh and leave to dry on a window sill. Then store in labelled envelopes in a cool place ready for planting in the spring. This year I have had great crops of both parsnips and little gem squashes from seed I save last year. I find it very rewarding. 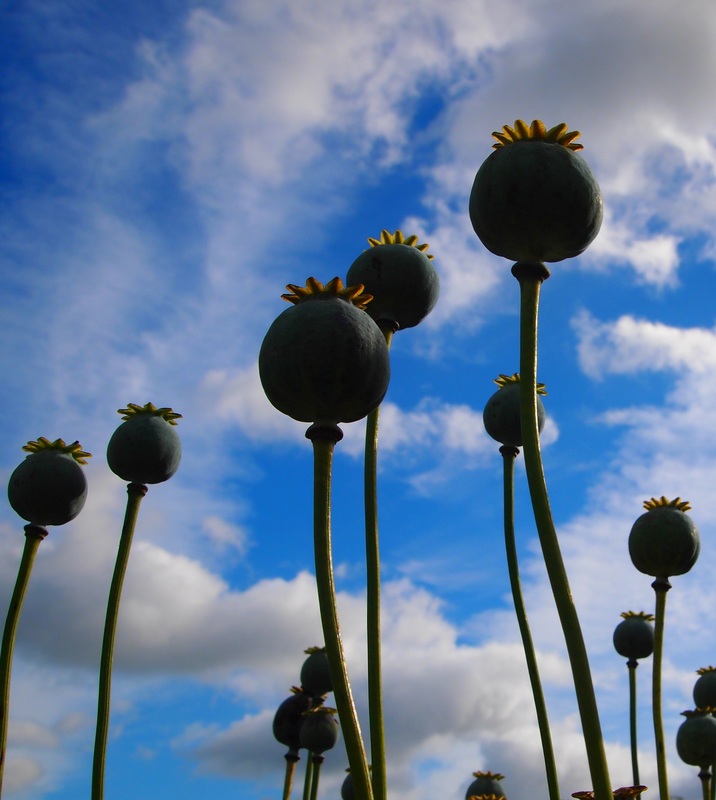 This entry was posted in Garden and tagged garden, nature, seeds on September 24, 2014 by Murtagh's Meadow. Today was a fabulous autumn day. It started with a cool misty morning, followed by clear blue skies. So it was an ideal day to do a butterfly and bee monitoring transect (For more information check out my earlier blog – https://murtaghsmeadow.wordpress.com/2014/04/27/bees-butterflies/). I have been very bad the last few weeks and haven’t managed to complete one – though it is hard getting the right conditions (must be 17 degrees Celsius or at least full sun). The bee transects are walked once a month but the butterfly transects should be completed once a week. 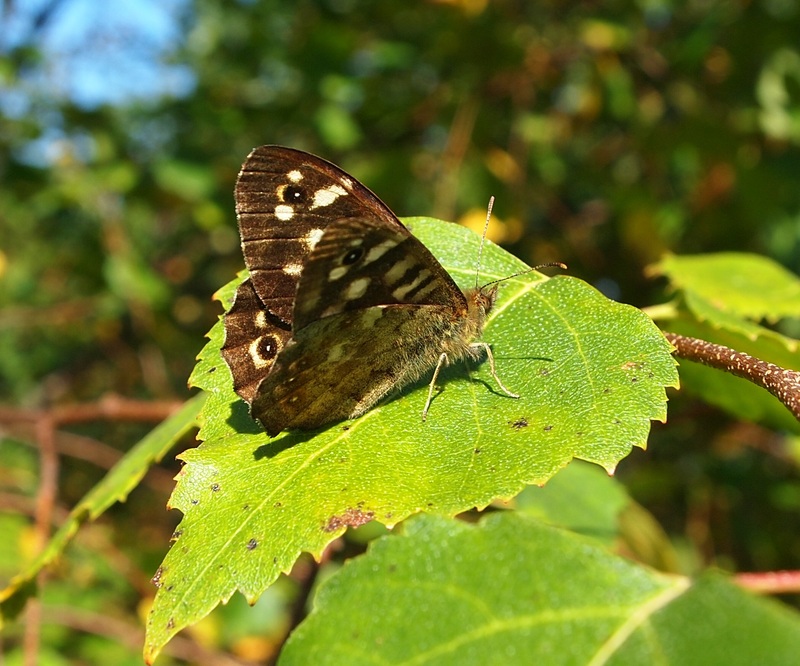 What amazed me today was the number of speckled wood butterflies still around. In the end I counted 31. They are looking slightly battered but no less beautiful. I also recorded a couple of green veined whites and after I had finished the transect I spotted a red admiral. There was plenty of buzzing in the hedgerows but it was mostly hoverflies, with only the odd bee about (Common carder). The majority of the hedgerow flowers have gone-over with the exception of ivy which is just coming into it’s own and the odd knapweed flower. 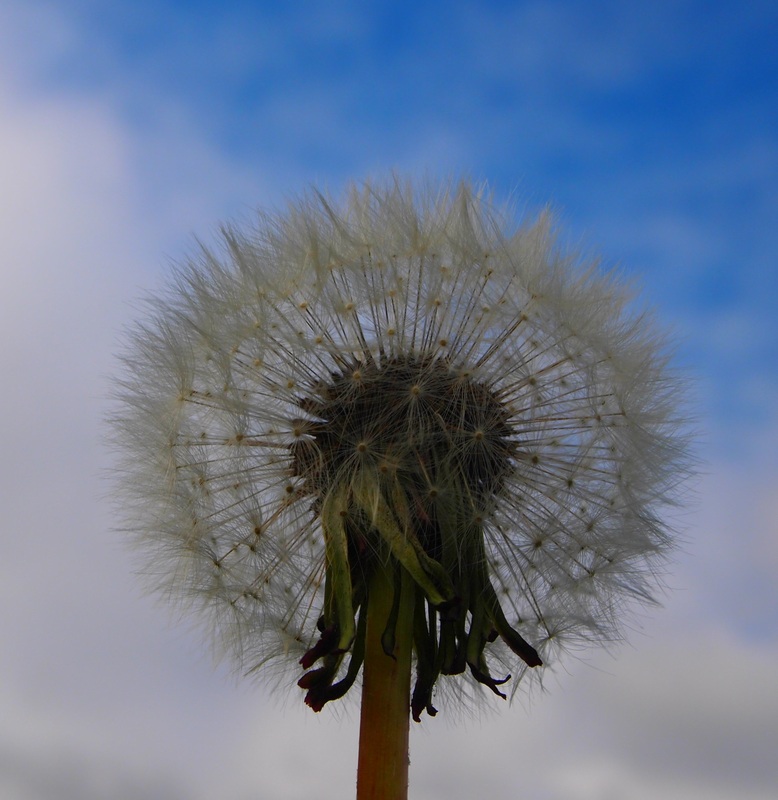 I gathered some of its seeds to spread in the meadow. The colours now are coming from the fruits and leaves. This entry was posted in Nature and tagged bees, butterflies, hedgerows, nature, wild pollinators on September 21, 2014 by Murtagh's Meadow. In the greenhouse, plants have benefited from our mild September. 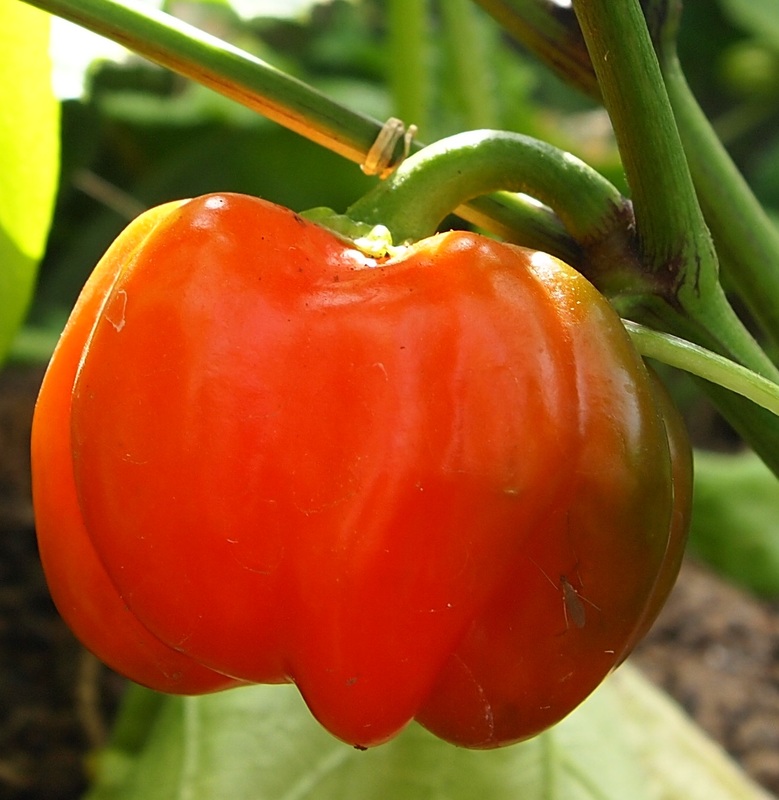 Despite going in late (we were still finishing the greenhouse) the miniature peppers are now a wonder red and the kids love them just as they are. The tomatoes are looking healthy. 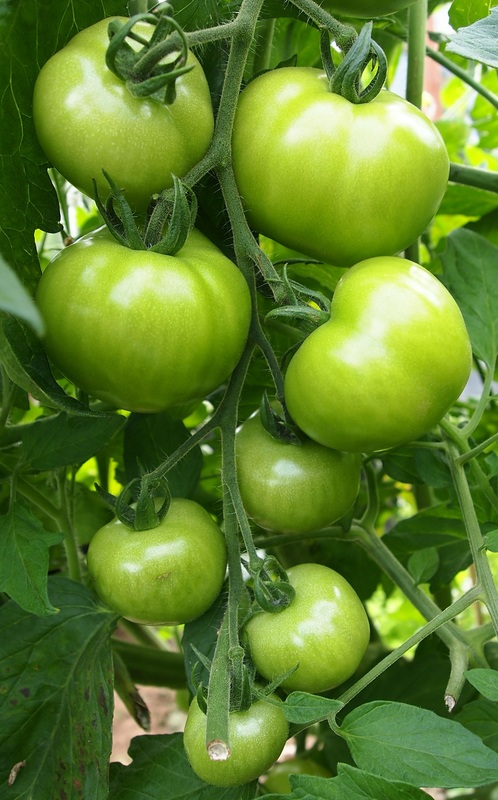 They are the best tomatoes I have every grown, even if they are still green. I can see lots of jars of green tomato chutney in my future. They are just beginning to go red so we may be lucky if the weather remains mild. Next year, I will have no excuses and will hopefully get things in on time. This entry was posted in Greenhouse, vegetables and tagged greenhouse, peppers, tomatoes on September 19, 2014 by Murtagh's Meadow. 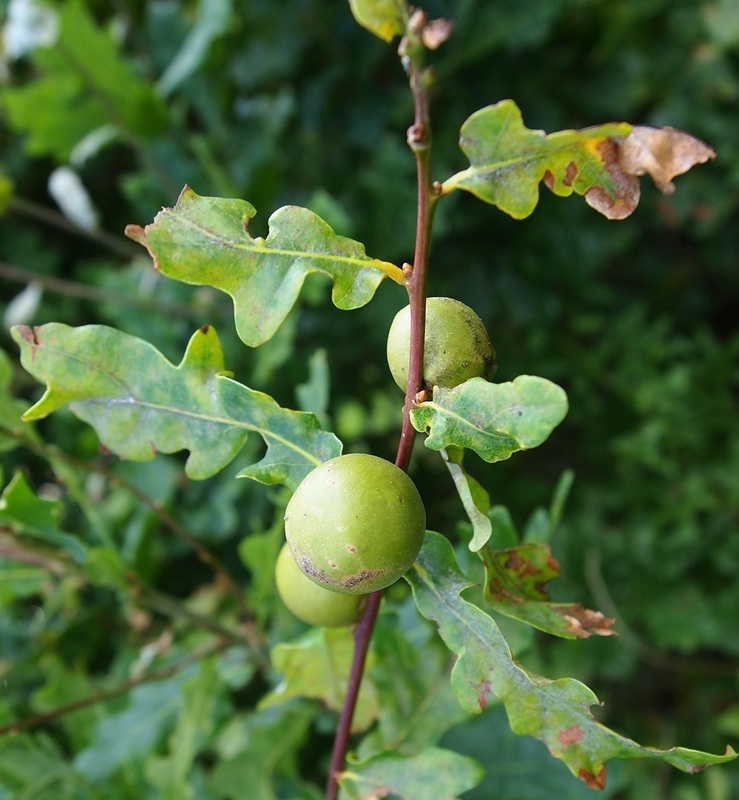 I found these oak galls growing on a small oak tree that is part of a hedgerow we planted a couple of years ago. It may look like something you could eat – one species is known as ‘oak apple’, but it is in fact the larva stage of a gall wasp. 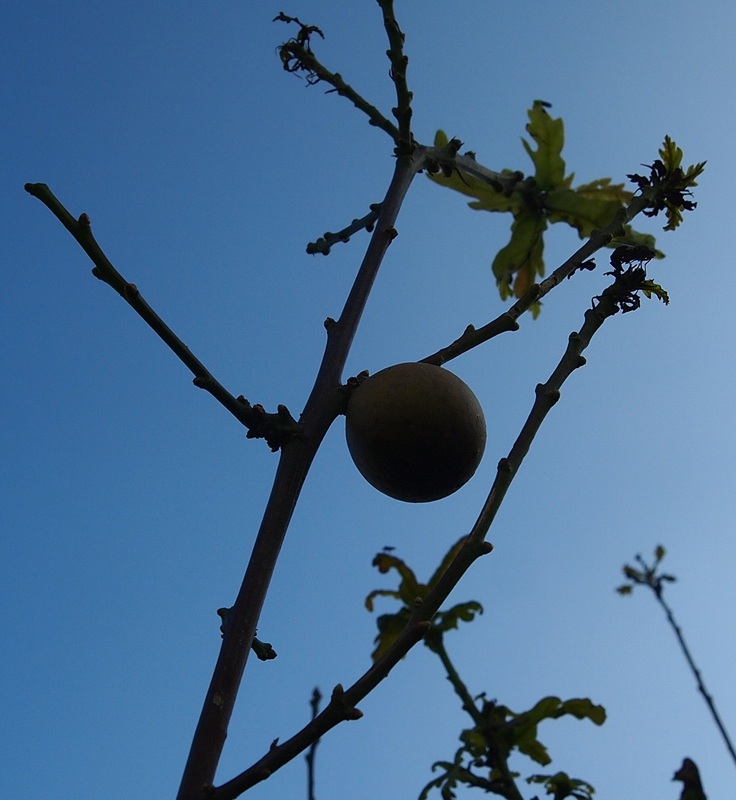 Our native oaks are hosts plants to up to 30 different species of gall wasps. Depending on the type of gall wasp, the female inserts eggs into either a vegetative bub, a flower bud, an acorn or even the root of the tree. When it hatches the grubs secrete a chemical that results in this abnormal growth, know as a gall. It is this that encloses the larva of the wasp. The gall does not harm the tree. I think these ones are Oak Marble galls (Andricus kollari), also known as oat nut, but am open to correction. 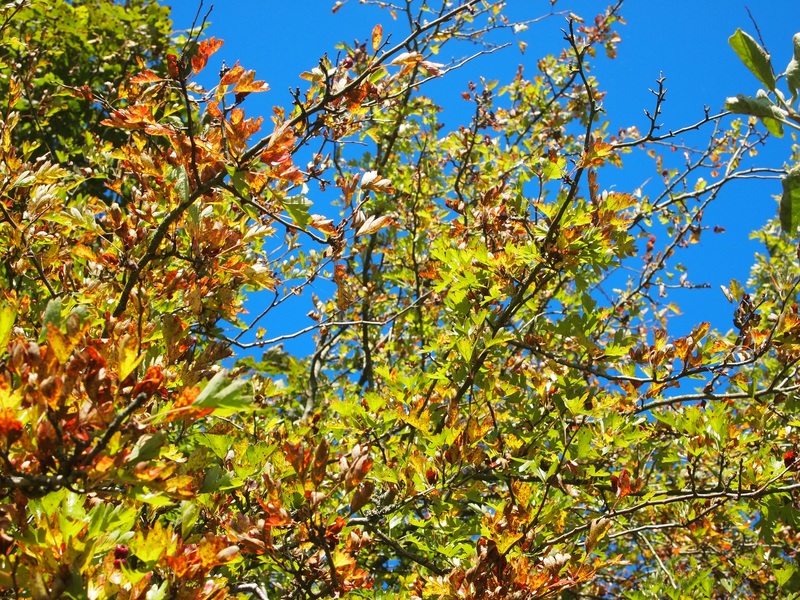 This entry was posted in Nature and tagged nature, oak, oak gall on September 16, 2014 by Murtagh's Meadow. 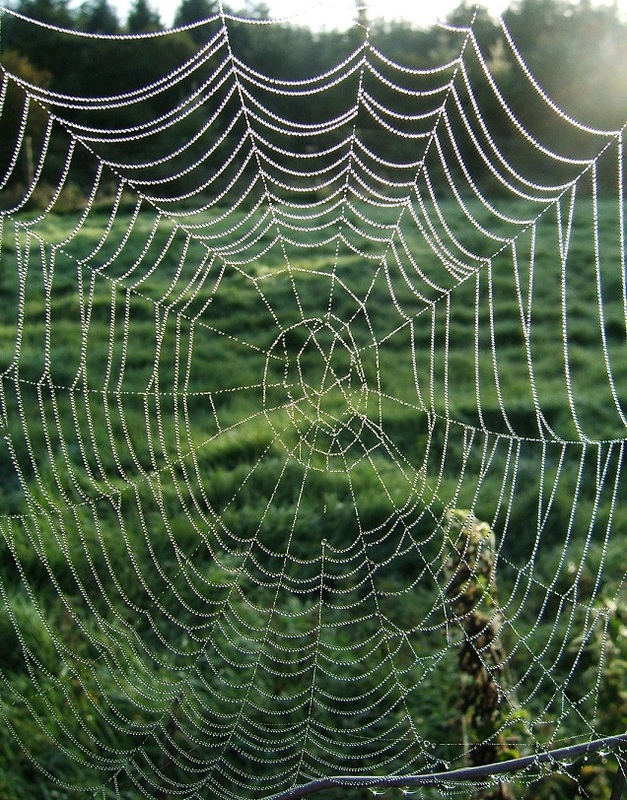 Here in Ireland we’re having a lovely start to autumn, with warm sunshine and those foggy, cool mornings full of cobwebs. The birch tree outside my office window is laden with seeds and is proving very popular with the birds. In the space of 30 minutes, I saw a bullfinch, chaffinch, greenfinch, sisken, bluetit and goldcrest feeding on it. Something, and I suspect it is a blackbird, has found the autumn olives (Elaeagnus umbellata). While it is a species that can be invasive in parts of America, it is little know here in Ireland. It is indigenous to eastern Asia. The berries are a wonderful colour and can get sweet. Ours still have a tartness to them, though the birds obviously don’t mind! 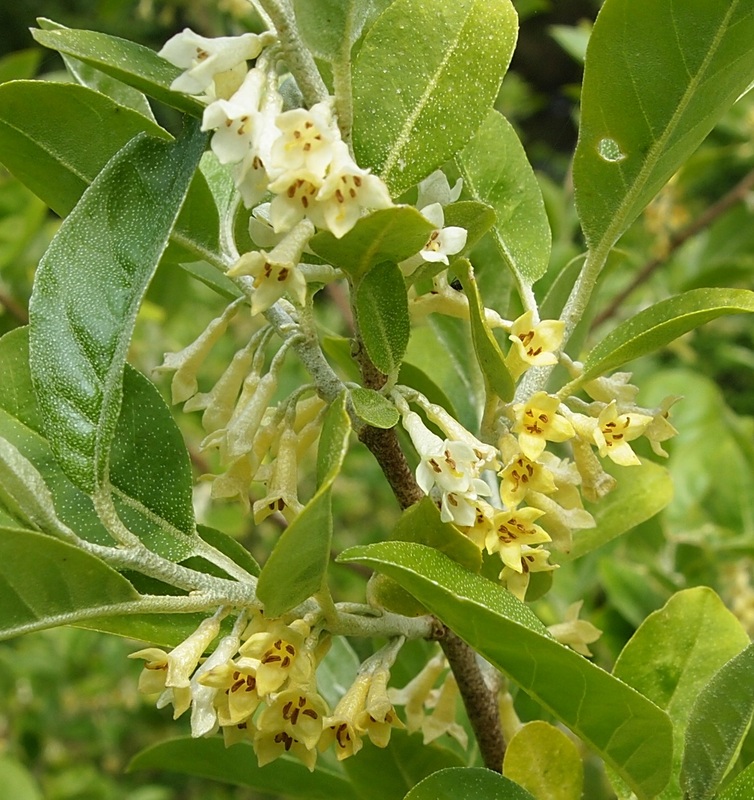 The flowers, which appear in late spring, are a lovely dusty, lemon yellow. 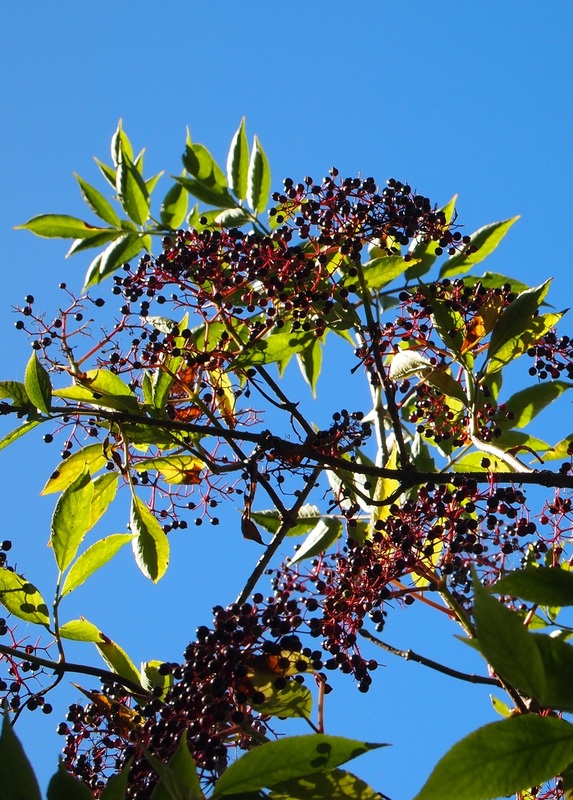 The red berries are spotted with tiny flakes of sliver. This entry was posted in Fruit, Garden, Nature and tagged birds, fruit, garden, nature on September 12, 2014 by Murtagh's Meadow. As well as the larger fruits, the smaller ones are ripening too. We harvested a few of the beautifully orange berries of the sea buckthorn today. The berries are exceptional high in Vitamin C. They are also said to be have potent antioxidant properties. They have a sharp, citrus flavour. We just mashed the berries with a fork and added some hot water, to create a pleasant soothing drink. 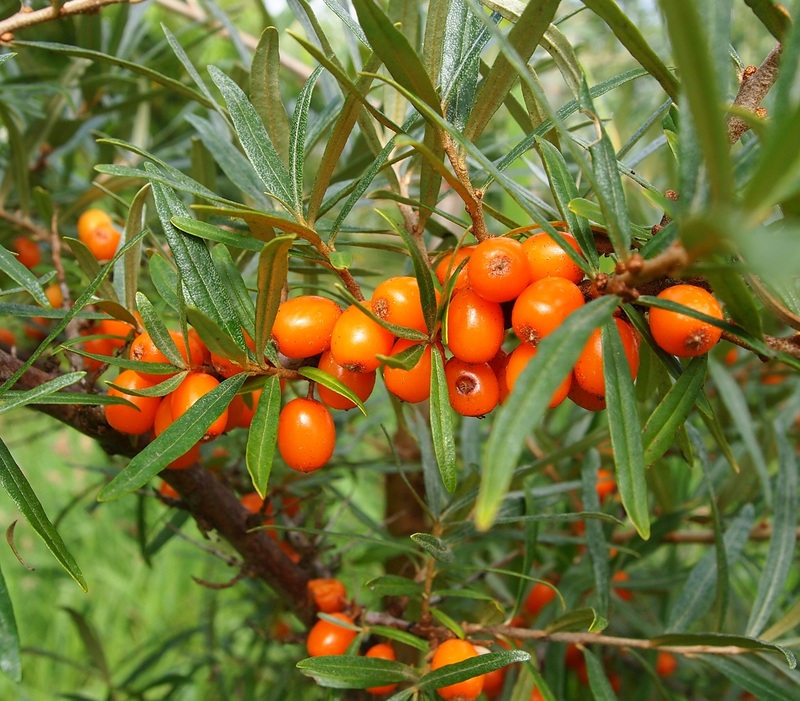 For Sea buckthorn to fruit you need male and female plants for pollination. We planted ours this spring in the new area of the garden from bare-rooted stock from fruitandnut.ie. The plants seem to be establishing well, though only a couple have fruit this year. 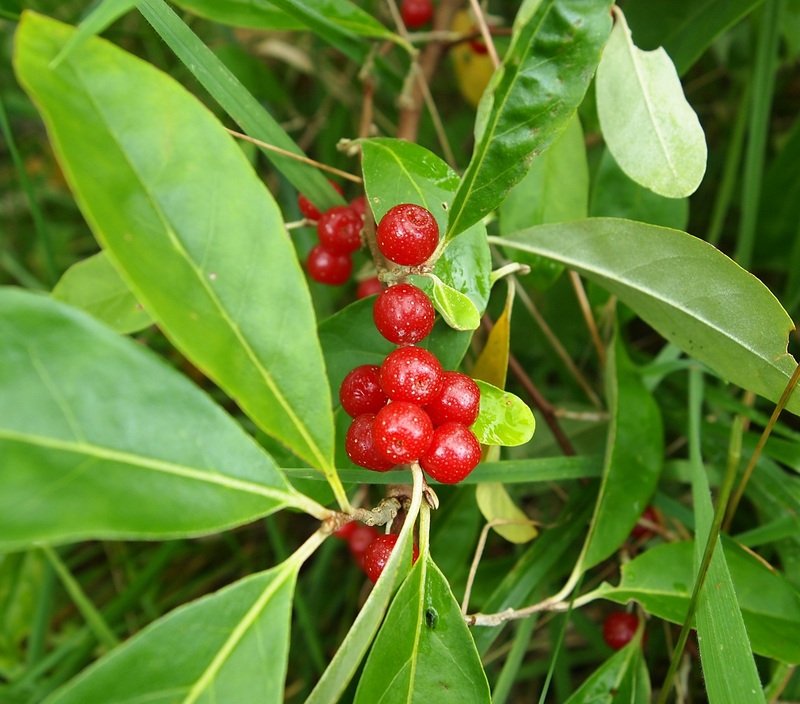 This entry was posted in Fruit, Garden and tagged fruit, garden, sea buckthorn on September 6, 2014 by Murtagh's Meadow.